科研速递论坛-文献求助|sci-hub|谷歌学术|文献互助|文献检索|文献代理|名校资源|免费VPN|学术共享 - Powered by Discuz! Recent confrontations between constitutional courts and parliamentary majorities, for example in Poland and Hungary, have attracted international interest in the relationship between the judiciary and the legislature in Central and Eastern European countries. Several political actors have argued that courts have assumed too much power after the democratic transformation process in 1989/1990. These claims are explicitly or implicitly connected to the charge that courts have constrained the room for manoeuvre of the legislatures too heavily and that they have entered the field of politics. Nevertheless, the question to what extent has this aggregation of power constrained the dominant political actors has never been examined accurately and systematically in the literature. 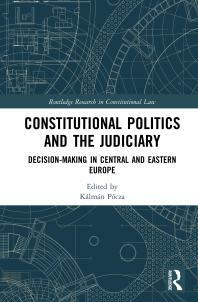 The present volume fills this gap by applying an innovative research methodology to quantify the impact and effect of court's decisions on legislation and legislators, and measure the strength of judicial decisions in six CEE countries. GMT+8, 2019-4-19 15:14 , Processed in 0.194070 second(s), 29 queries .